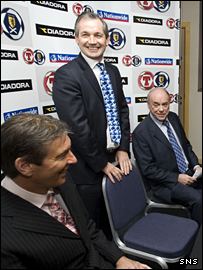 George Burley has been introduced as the new Scotland manager at a news conference at Hampden Park. The 51-year-old former Southampton boss, who has signed a contract until 2012, said he was honoured to be asked to manage his country. "As a Scotsman you have a vision to do well for your country," he said. "Now the dream is to qualify for the World Cup in 2010. The country has belief, I'm certainly up for the challenge and we'll go for it." Former Ipswich, Derby and Hearts boss Burley was on a four-man shortlist alongside Mark McGhee, Graeme Souness and Tommy Burns. Burley said he was delighted the Scottish FA chose him over the others vying to succeed Alex McLeish. "When Scotland showed interest there were so many outstanding candidates with huge experience," he said. Scotland have failed to qualify for the finals of a major tournament for 10 years and Burley said he was keen to put that right. "This job gives the opportunity to try to do something, to try to get to the World Cup finals, and as a manager you couldn't ask for more than that." "It's something I'm really looking to. I feel I'm ready for it. "I've got a contract, if the SFA want to do it, until 2012. I'm fully committed, my one thought at the moment is the next two-and-a-half years. Is George Burley the right man to lead Scotland? "Let's go for it, two, two-and-a-half years, can we qualify for the World Cup? That's my aim." The new Scotland manager added: "Timing is key in any situation. "The timing is right, what Scotland have done over the last couple of years has excited everyone." SFA chief executive Gordon Smith said: "We'd obviously like to welcome George. The standard of candidate was really high. "They all had the assets we were looking for and that was a big factor. George came out on top because of certain aspects. "We had four candidates we felt were high class and all capable of being Scotland manager - but George has come through and been successful. "His standards are very good in terms of what he's achieved in the game and I know he's very enthusiastic. "We want to do our best. We just failed to qualify for the European Championships and just getting to the World Cup finals would be good." Burley succeeds McLeish, who quit to take charge of Premier League side Birmingham at the end of November. Burley's agent Athole Still said: "He's a football guy and by that I mean he likes his teams to play football. "Now when he gets his squad together, I'm quite sure you will find that he'll get the very best out of the players in the Scottish squad." Burley was interviewed for the post last week after Southampton reluctantly agreed to the SFA's request to speak to their manager. 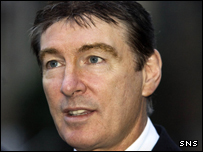 Born in Cumnock, Burley has vast experience in club management, having coached Ayr, Colchester, Ipswich, Hearts and Derby. He led Ipswich to a fifth-place finish in the Premier League in 2001, securing a Uefa Cup place in the process. At Hearts, he briefly threatened to make the Edinburgh side serious challengers to the Old Firm but departed after a superb start to the 2005-06 season because of off-field matters. He also played for Ipswich and won 11 caps for Scotland as a defender from 1979 to 1982.